In brief, first day covers are specially designed envelopes with attractive Royal Mail stamps and pictorial postmarks. These very desirable collectors' items are ideal for that unusual gift and look great framed. If you are looking for a gift, try our themes section - where you will find over a hundred different themes to choose from ranging from Aircraft to Wildlife. Many of the first day covers on this site have also been signed by famous people: stars, politicians, celebrities etc. For those who want a more in depth description of what first day covers are all about, the following notes should answer all of your queries. 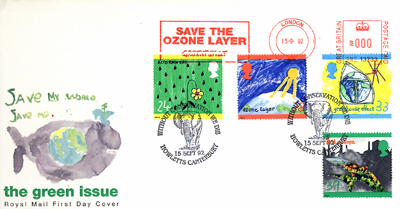 The above first day cover was produced to coincide with Royal Mail's special stamp issue featuring Pub Signs in 2003. The stamps have been franked with a special handstamp (postmark) at Queen's Head near Oswestry - one of the few locations which shares its name with a pub! 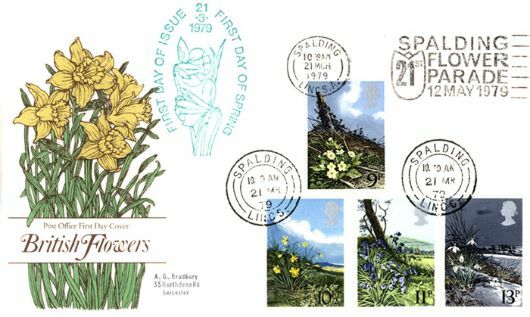 First Day Covers are often confused with Souvenir (or Commemorative) Covers. However, although they may look similar, they differ in one important aspect, namely: Souvenir Covers are usually issued to coincide with the date of a specific event or anniversary, whereas First Day Covers are issued on the same date as the new stamps. Both types of cover appear on this website and are easily distinguishable. The covers (or envelopes) are available in a variety of makes, which broadly speaking can be split into two categories: Standard (or commercial) covers and Official (or sponsored) covers. These are produced primarily for general sale to collectors who buy the blank envelopes (i.e. without stamps or postmark) in order to affix their own stamps and then arrange to have them postmarked. Over the years there have been many makes, including Cotswold, Mercury, Philart, Stuart and of course Royal Mail's own blank envelope, which is also available fully serviced from Royal Mail's Tallents House (formerly the Philatelic Bureau). Other makes include the Abbey Series of covers (1969-1982) which were limited to around 2,000 copies per issue. These were sold with the stamps and special postmarks (not as blanks). Another popular series with collectors is the Sotheby's Fine Silks Series (1984-1995). These depicted fine arts or collectibles sold by Sothebys, the image printed on silk-like material and being related to the stamp issue. The Cigarette Cards Series is a similar range which started in 1988 to 1994 and featured reproductions of cigarette cards, again on silk-like fabric. Official covers are normally defined as covers produced by private organisations or cover producers who at the same time sponsor a special handstamp for use on their cover. In the early years, most were produced by societies or companies whose work/activity related to the theme of the stamp issue. However, most are now marketed by cover producers and are normally very limited in number - although still referred to as official covers, a more accurate description would be sponsored covers. For this website, I have used a broader definition than in my Collecting British First Day Covers catalogue - there are many covers using an ordinary FDI postmark or other special handstamp which are obviously official in the sense that they have been produced by organisations for specific events or anniversaries etc - therefore these are also described as 'official' on this website. 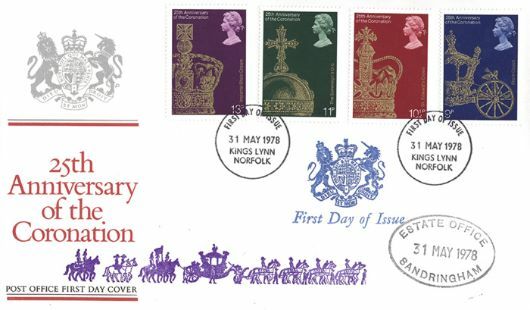 Collectors can find a wealth of information about the different covers which have been produced for British stamp issues by purchasing a copy of the catalogue Collecting British First Day Covers which is the only publication on the subject to have been published every year since 1981. For full details please click here. This catalogue lists alongside each postmark the sponsor's name and/or cover series reference. These are normally pictorial in design and are by far the most popular with collectors. They are specially applied by trained Royal Mail staff at one of their five regional Special Handstamp Centres (SHC). Modern techniques now allow for some very intricate designs. Anyone can sponsor a special handstamp by applying to Royal Mail. Notification of their use is advertised in advance by Royal Mail. Their use is not exclusive to the sponsor - collectors and other dealers/cover producers can send in their first day covers to receive one of these special handstamps. 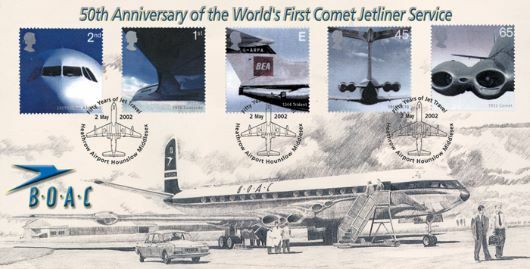 The cover shown above was produced to coincide with the 2002 Airliners stamp issue. The cover has the full set of five stamps postmarked with a Heathrow special handstamp. Virtually every special handstamp which has been in use on the first day of issue of a stamp issue is illustrated on this website and listed in the catalogue Collecting British First Day Covers - for full details please . These were first introduced with the 1964 Shakespeare issue when the Post Office realised that there was a need for proper postmarking of philatelic mail. They are circular in design with the date of issue, location and the wording 'First Day of Issue'. Most large towns had their own FDI postmark for each stamp issue. These were withdrawn from use after the 1998 Christmas issue. The above Post Office cover celebrated the 25th anniversary of the Coronation in 1978 and was postmarked at King's Lynn - the nearest FDI office for Sandringham. The cover also bears a Sandringham Estate Office official cachet with a couple of unofficial cachets. These are also known as circular date stamps and are the everyday postmarks used at Post Office counters around the country. Some collectors prefer this type of postmark because it looks more authentic than a special handstamp. However, because these are applied at Post Office counters, there is no guarantee of a good impression. Staff may have to work with over or under inked stamp pads or worn date stamps - these all affect the clarity of the postmark. Having said that, there are some very interesting cds postmarks available, e.g. there is a Post Office in the village of Rose (Cornwall) - which is a most appropriate postmark on any roses or flowers first day covers. The above Greenwich Meridian cover was franked at Clockface Post Office in St Helens - what could be more appropriate for the cover design? As most sub Post Offices only frank Special Delivery mail (formerly Registered Mail), this is often the only way to obtain these postmarks. Covers have to be prepared with all the Special Delivery labels and the additional postage to cover the cost of the special service - since the change over to the Special Delivery Service these labels are normally placed on the reverse of the envelope, leaving the front free for the new stamps. These machine postmarks are applied to the vast majority of our mail. A slogan postmark consists of two parts, viz: a circle showing the date and town; and an advertising slogan or wavy line. These can be highly sought after if the slogan is relevant to the stamp issue. However the stamps must be sited correctly to make the slogan clearly legible, and all the stamps must be franked. The above is a perfect example - the slogan relates to Spalding's Flower Parade and the stamp issue is all about flowers. The stamps are sited in such a way that the pictorial part of the slogan postmark can be easily seen and the circular part of the slogan is mostly on the envelope clearly showing the date. The remaining stamps have been franked with a Spalding CDS postmark - in most instances the additional cancellations will be CDS or FDI postmarks, although covers with the remaining stamps franked with a special handstamp are also known. These are applied in-house by companies using their own franking machines used for everyday business post and usually contain company logos or text having relevance to the stamp issue. As Meter Marks are not applied by the Royal Mail, and normally have not pre-paid any postage (having a zero value), they are not postmarks in the true sense. The postage stamps on these covers have to be additionally franked by Royal Mail to give a value to the covers. However, some interesting combinations of meter marks and postmarks exist as is shown in the above example. Collectors can see several thousand postmarks illustrated in the catalogue Collecting British First Day Covers. For full details of this publication please click here. The first commemorative stamps were issued in 1924 to mark the Wembley Exhibition. However it was not until 1963 that the then Post Office started to issue commemorative stamps on a regular basis. The Post Office issued their first FDC envelope with the 1964 Shakespeare issue. These are small sheets of different stamps (usually a block of four or six) joined together with a pictorial or informative border. Greetings Stamps were first issued in 1989 to provide the public with attractive stamps which would be on sale all year - their intended use being for greetings cards. They were issued in books of ten stamps. Greetings stamps were discontinued in 1997 with the Botanical Flowers issue. Royal Mail revived the idea in 2001 with their first issue of Occasions stamps. With these issues came the concept of customised labels or generic labels attached to each stamp. 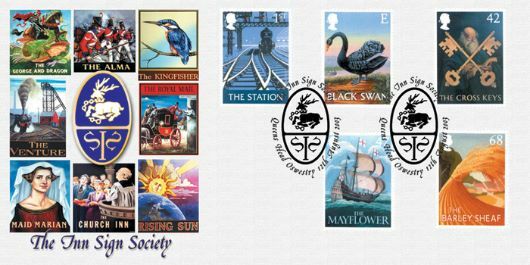 To mark the end of the 20th Century Royal Mail embarked on an ambitious two year stamp programme (1999-2000). Each month saw the issue of a set of four stamps - all conforming to the same size with each stamp designed by a different artist. There were 48 stamps issued in 1999 each set covering a different aspect of British history, e.g. The Inventors' Tale, The Patients' Tale, The Farmers' Tale etc. The 48 stamps for 2000 represented different millennium projects with broad titles such as Above and Beyond, Mind and Matter, Stone and Soil etc. The final set of four stamps, issued in January 2001, was titled 'Hopes for the Future', being represented by children's face paintings. Royal Mail had several trials with self-adhesive stamps before issuing their first commemorative self adhesives - these were in the form of books of ten stamps for the Cats & Dogs issue of 2001 (also the Kipling set of 2002). Stamp Books of six 1st Class stamps (4 definitives and 2 Submarines) were issued in April 2001 to increase public awareness of special stamp issues. There have been a number of similar issues all following the same format. The first commemorative self adhesives to be printed in sheet format were the Christmas issue of 2001 featuring robins. This section contains all the new stamps, i.e. those issues which Royal Mail offers a first day of issue facility. Complete stamp book panes on cover including se-tenant (mixed value) panes. Prestige Stamp Books were originally issued with definitive stamp panes only, the first being the Stamps for Cooks £1 Book. There are now usually three or four PSBs issued each year. They include both commemorative and defintive stamps - sometimes new stamps previously unissued. Most of the panes are now se-tenant, i.e. different stamps joined together. Books of 4 or 6 1st Class Stamps with a large commemorative label attached, now discontinued, these were issued once or twice a year (1993 to 2001) to mark specific anniversaries or events. The first was issued to mark the tercentenary of the Bank of England. Self Adhesive stamps were first introduced by Royal Mail in 1993 on an trial basis. There were several trials with 1st & 2nd Class NVI (non-value indicators) stamps - now all stamp books contain self adhesive stamps. Stamp Coils are rolls of stamps sold from vending machines - these have included several interesting se-tenant strips. Some issues were joined along the side edge, i.e. Horizontal (H) or joined Vertically (V) i.e. along the short edge. Stamp Varities include changes of watermark, paper, perforations, phosphor, gum etc. where the issue dates are known. Similar changes to stamps from stamp book panes are included in the Stamp Book section. This is the smallest category with only four issues. These are Special Retail Books which Royal Mail issued in 1999 and 2000 which consisted of one pane of eight 1st Class NVIs and one pane of two Millennium stamps (three of the issues were se-tenant pairs). These were issued to increase public awareness of new stamps. Regional Stamps were first introduced by the Post Office in 1958 initially for Scotland, Wales, Northern Ireland, Isle of Man, Jersey and Guernsey. These stamps are similar in style and size to the standard definitives with the addition of regional emblems. Jersey and Guernsey gained postal independence in 1969 with the Isle of Man following in 1973 - thus regionals for these islands were short lived. The Scottish, Welsh and Northern Ireland issues continued until 1999 when they were gradually replaced by the Country Pictorial Stamps. Varieties to Regional stamps include changes of watermark, paper, perforations, phosphor, gum etc. where the issue dates are known. The first Country Pictorial Stamps were introduced in Scotland and Wales in 1999 with Northern Ireland following in 2001. These stamps feature emblems and pictures associated with each region and have gradually replaced the regional stamps. To complete the set of four nations the first England stamps were issued by Royal Mail in 2001. The Jersey and Guernsey 'Occupation Stamps' were issued during 1941-1944. Postage Due and To Pay Labels have always been difficult to obtain on first day cover as usually no advance notice was given of their issue. The Frama Labels were issued as an experiment at a few selected Post Offices in order to provide an out-of-hours service to the public. Machines printed and dispensed the labels - their values depending on the amount of coins inserted by the customer. This section includes first day of issues of new postal services, e.g. Recorded Delivery, Speedpost etc.